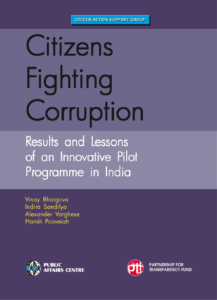 Authors Vinay Bhargava, Indira Sandila, Alexander Varghese and Harish Poovaiah, argue that “there is hope” – that innovative civil society approaches to promote good governance can yield significant benefits to the very poor. The report’s fundamentally positive conclusions are based on projects pursued by 14 civil society organizations (CSOs) working in four diverse Indian states in India (Odisha, Karnataka, Rajasthan and Uttarkhand) and covering more than 1000 villages. The project completion reports by partner CSOs and independent evaluations by outside organizations found that CAC partners have been extremely effective at enhancing the transparency of public services and bodies. Awareness campaigns increased the number of applications to government rights and entitlements, citizens formed collective action groups and worked with local media to demand good governance, and citizen monitoring and vigilance improved delivery of services such as ration cards. The report demonstrates that with the proper investments and the right conditions, the strategy and approach of CAC can be replicated and scaled up successfully in the future.